It isn’t often that we are able to watch ourselves speaking to an audience. 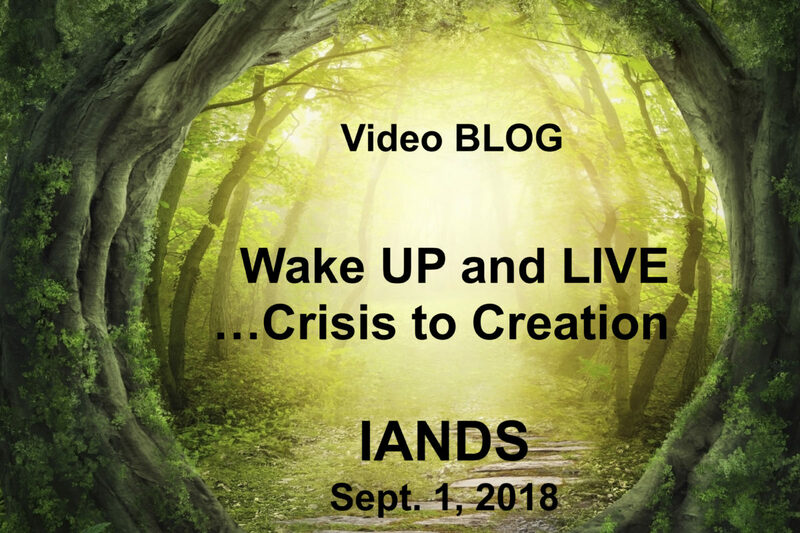 At the IANDS International Conference back in September, all of the speakers were being videotaped. I was humbled as I heard speakers that could absolutely capture their audience and get their messages across so easily. “What an amazing talent that is”, I was telling myself as I walked up to the stage. I talked with several people about how spectacular their presentations had been and asked them if this was a talent that just came naturally? Without exception, each and every one of them said it took years of practice and “doing” before they felt adequate! Whew…I was relieved to hear that! As I received this link to be able to share this video of me speaking with you, I was also reading comments written by the audience. Most were good, but one comment stood out and it got my attention. “Terry is too enthusiastic!” At first I thought, oh my, isn’t it good to be enthusiastic? Then I watched myself…humbled again. YES, we all keep learning and growing. I share my words with utmost humility. I hope you will enjoy it! The video is one hour long. You will see that the man I was speaking with is talking first. His name is Jim McCartney. I really enjoyed getting to know Jim over the course of four days. I think you will enjoy his talk too, especially knowing what it took for him to get in front of an audience! Jim had a Near-Death Experience back in 1997 as he suffered a grand mall seizure. He was a therapist and rehabilitation counselor, but his near-death left him with brain and heart damage and unable to work. 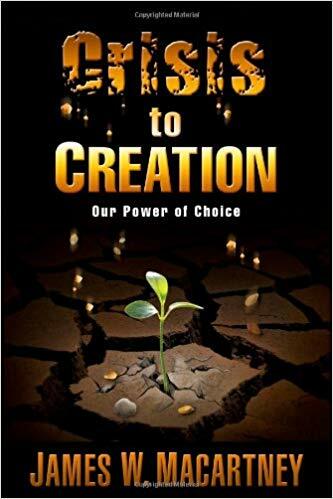 He wrote a book called Crisis to Creation: Our Power of Choice in 2010. He was challenged by his NDE and his doctors to transcend his limitations. He was able to do this through the written word, but “speaking” has been particularly challenging to overcome. He suffered another heart attack only a couple of years ago. I loved the title of his book and I had read it before going to Seattle. I knew why they put us together after that! He had such incredible difficulties to overcome, but through the power of choices he is showing us we can ALL overcome totally amazing circumstances! He has some fascinating stories in his book. While the stories of my NDE are fascinating to many and Marj’s LIGHT story plants seeds of miracles in life, the most powerful message is one of hope. We can all WAKE UP and LIVE while we transcend our tragedies and challenges in life through our own creative abilities. For Marj it was transcending grief into a life that is joy filled and peaceful helping others. For me, it was overcoming illness into a life that not only was healed and healthy, but is helping others learn how to create their own healthy life, full in mind, body and spirit. Crisis to Creation. My own journey of experiences, from my NDE to now, was a living example of Jim’s theories in his book. 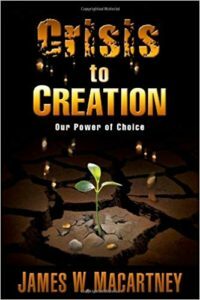 Yes, any of us CAN go from crisis to creation. 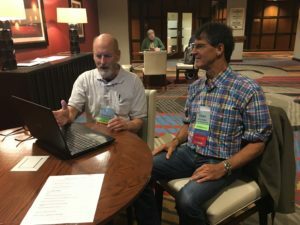 Jim is totally brilliant and working to share some understandings he learned during his NDE about the creation of our world.This is my favorite picture of Jim. He is showing his work to Dr. Eben Alexander (the neurosurgeon who wrote Proof of Heaven) who is fascinated by Jim’s theories. I will be watching where Jim’s journey takes him in life! Click here or below to connect with the video.